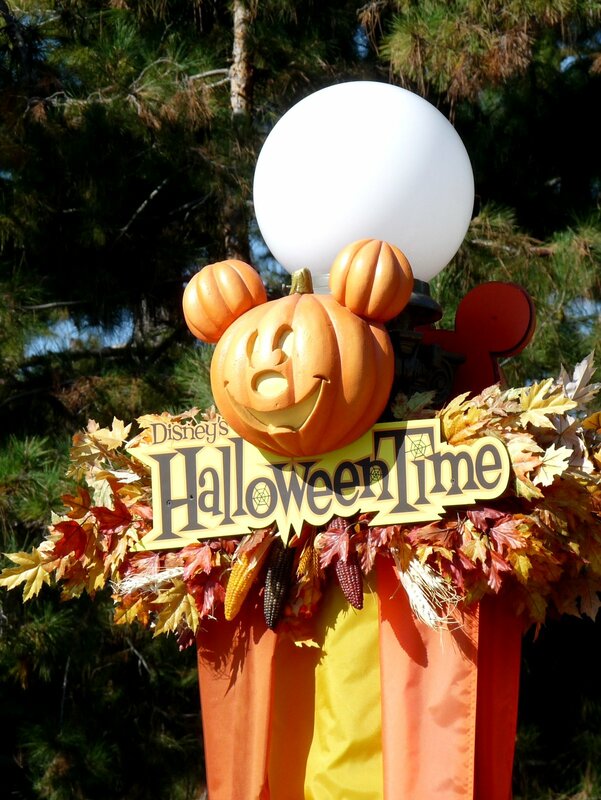 If you’re thinking of spending a Halloween with Disney, now’s the time to start planning! Tickets will go on sale next month, and they go quickly. My husband and I went to Disneyland for October 30 & 31 two years ago, and we had a blast. 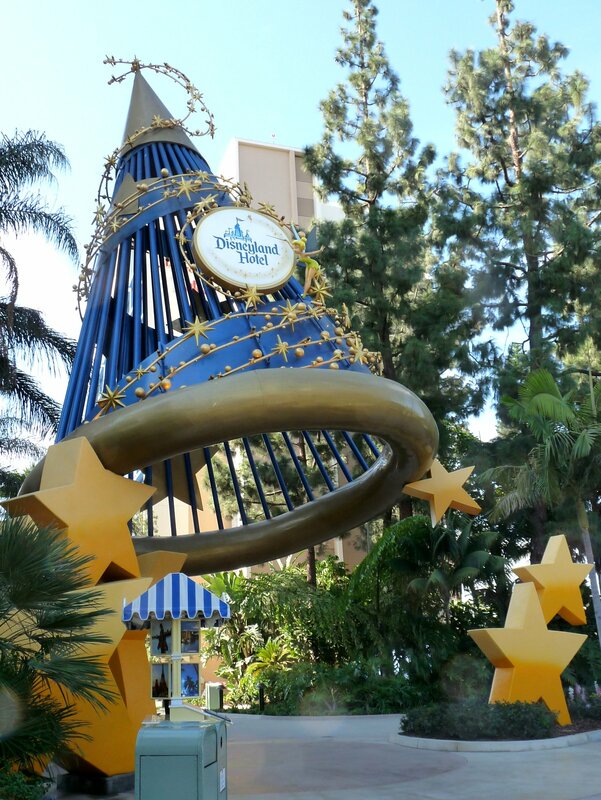 We stayed at the Disneyland Hotel, which overlooks Downtown Disney. In California everything’s accessible by foot – we walked out from our hotel into the thick of the shops, restaurants and entertainment ‘downtown’, and a further 10 minute walk brought us to the gates of both Disneyland and California Adventure. Signs of Halloween were everywhere – hay bales, pumpkins both real and faux (including a giant pumpkin-head Mickey at the entrance to Main Street USA, Halloween treats for sale in shops and restaurants, and lots of creepy/cute merchandise in the shops. On Halloween, Disneyland closes to the general public around 3pm, and re-opens at 6pm for people with tickets to Mickey’s Not So Scary Halloween Party. These tickets must be reserved in advance and are an additional cost over and above your park-hopper passes, but they’re well worth the extra cost! During the late afternoon on October 31st there’s an air of excitement – people dressed up in costume ( both children and adults) begin heading for the park, street entertainers come out, and the lights at the entrance to Disneyland start to glow. The atmosphere is like a big street party. Food is available in the parks in the evening, but we chose to fortify ourselves at one of the restaurants in Downtown Disney first, then went back to the hotel to change. If you’re going, please note that the temperature can drop considerably at night even in the sunny states, and our night was no exception. I had on a long-sleeved costume and was still chilled by the end of the party. parties in different locations, the opportunity to have your photo taken in front of the giant pumpkin Mickey (the professional photographer will use either his own camera or yours, or both – you pick) trick-or-treat stations that were patronized just as much by adults as kids when we were there, the opportunity to meet and pose with your favourite Disney villain (very popular and they rotate shifts, so if this is a must-do for you line up early before your character leaves for a break), shops galore, fireworks and a Halloween parade as the finale. Glowing ghostly Mickey heads light your way around the park, an eerie blue fog billows across the lagoon and haunting music makes your feet itch to dance. It’s a night to celebrate all that’s dark and creepy, Disney style. Lest you think this party is just for children, let me tell you that at least half the people there that night were adults, and most of them were in costume. Although I’m not a fan of the commercialism that has crept into the Disney parks, nobody does parties like they do! This was an item on my bucket list, and it didn’t disappoint. one significant difference: in Disneyland, for the Halloween season the Haunted Mansion is converted into The Nightmare Before Christmas both indoors and out – the plantation-style mansion drips with Spanish moss, special black & white-ribboned Halloween flower arrangements, pumpkins and Jack Skellington’s Christmas list, and of course Jack himself presides over the entire thing. Inside, the ride has been transformed as well, into a spectacular multi-coloured journey tweaked with Jack’s special style – it’s so cool, even my hubby was impressed. Disneyland also sells a lot of Jack Skellington merchandise, so if you’re a fan, that might be an added incentive. My hubby bought a ‘Tall, Dark & Gruesome’ t-shirt that he wore under his lab coat as a mad scientist; I was his freaky-looking re-stitched and partially-revived creation. When I booked, tickets went on sale at the beginning of July for Disney club members, and later in the month for non-members. The online order system had gone down, so I spent a dedicated 45 minutes on the phone calling back repeatedly until I got a live person. There are rules for dressing in costume at Disney: 1) you can dress as a Disney character but you’re not allowed to pose for photos with people you don’t know; 2) costumes can’t drag on the ground (tripping/ride machinery hazard); 3) your eyes must be visible (coloured contacts are allowed – mine were dead white); 4) your costume can’t scare small children. Most people do dress as Disney characters, but you don’t have to, although doing that will likely increase your chance of being selected to ride in the parade. Daytime temps are quite nice but, as I mentioned previously, the temperature can drop quite a bit after dark, so be prepared – I saw quite a few women shivering in sleeveless outfits. Buying an ‘all-inclusive’ package can save you some money. You get vouchers for meals that are supposed to be specific to certain restaurants and meals, but when we were there the serving staff encouraged us to use them for just about any meal. Wear comfy shoes; even in Disneyland, which is more compact, you’ll still do lots of walking. If you’re interested in doing the Disneyland version, there’s transportation between the airport (LAX) and Disneyland. In Los Angeles, there are tons of things to see, including the original Universal Studios park, Grauman’s Chinese Theater, Hollywood, other movie studios, the fabulous Getty Museum…the list is practically endless. If you rent a car, you can drive up the coast to Malibu, visit beautiful Santa Barbara, and generally enjoy the wonderful California weather, scented with the ocean and eucalyptus trees. Mickey’s Not So Scary Halloween Party runs on selected nights throughout the Halloween season, so if you can’t make it for Halloween night itself, there are still plenty of other dates to enjoy it. The one on Halloween itself wasn’t nearly as crowded as I was afraid it might be, just a nice amount of people wandering around and enjoying the ambience. Please check this year’s dates and times on the Disney websites (Disneyland and Disney World) for the most up-to-date information.